This updated edition of Program Evaluation in Practice covers the core concepts of program evaluation and uses case studies to touch on real-world issues that arise when conducting an evaluation project. This important resource is filled with illustrative examples written in accessible terms and provides a wide variety of evaluation projects that can be used for discussion, analysis, and reflection. The book addresses foundations and theories of evaluation, tools and methods for collecting data, writing of reports, and the sharing of findings. The discussion questions and class activities at the end of each chapter are designed to help process the information in that chapter and to integrate the information from the other chapters, thus facilitating the learning process. 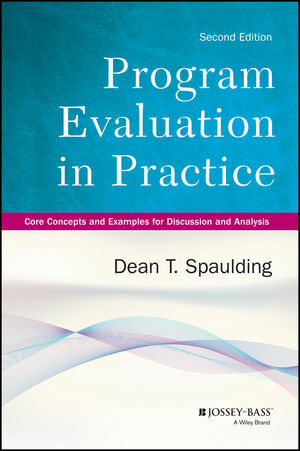 As useful for students as it is for evaluators in training, Program Evaluation in Practice is a must-have text for those aspiring to be effective evaluators. Dean T. Spaulding is a professional evaluator and also serves on the faculty at the College of Saint Rose in Albany, New York in the Department of Educational Psychology, where he teaches educational research methodology and program evaluation. He is a coauthor of Methods in Educational Research: From Theory to Practice from Jossey-Bass.